Bo Xilai, the former boss of the Chongqing Communist Party, was recently sacked after a corruption scandal involving his family. Jiang Weiping, an Honorary Member of PEN Canada, is a Chinese journalist who served a six year prison sentence for “inciting subversion of state power” after he published an exposé of Bo’s corruption more than a decade ago. PEN Canada supported Jiang throughout his prison sentence and in 2009 helped reunite him with his family in Toronto. On 18 April, 2012, Jiang had the following exchange with our president, Charlie Foran. 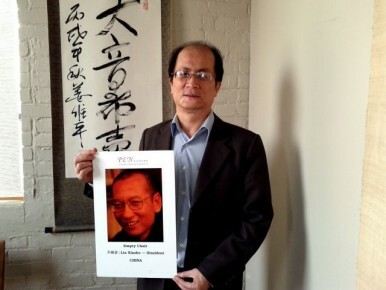 Jiang Weiping holds up photo of PEN Honorary Member Liu Xiaobo. Charlie Foran: The fall of Bo Xilai is a global news story right now. You are part of this story. Can you explain? Jiang Weiping: The news of Bo’s downfall didn’t surprise me at all. For more than 20 years, I was one of the few journalists who knew Bo well and had detailed knowledge of his political and family life. Moreover, in 1999, I was the first reporter in China to publicize his corruption and lawbreaking. As a result, I was wrongfully arrested on Dec 4, 2000 on direct orders from Bo — in retaliation for an article published in the July issue of Frontier magazine the previous year, an exposé of the corruption and bribery in which he and his wife, Ms Gu Kailai, were deeply involved. On Jan 21, 2002, I was given an 8-year sentence in prison by Dalian Municipal Court for “leaking national intelligence overseas” and “inciting subversion of state power”. On appeal, the Liaoning Provincial Court reduced this to 6 years. It was shocking and totally wrong to conclude that a government official’s criminal acts could be regarded as “National intelligence”, and that they could present themselves as an embodiment of the state. My case was a typical example of how justice is often overshadowed and replaced by power in China’s judicial system. I was stripped of all human freedom and dignity for more than 5 years during my time in prison. I see my incarceration as a loss for Bo, too: by using his influence over the judicial system to retaliate against any opposition, he added another count to his already long list of crimes. I’m glad to know that Bo has finally been arrested, but I also regret that he has been able to get away with so much in the past. CF: Everything you reported in China about Bo”s dealings, and all casino australian that you have written about him since from Canada, has been vindicated. Does this make those years in prison, and forced silence, easier to bear? JW: I never lost confidence that what I had chosen to do was right. I finished drafting my second book The Memoir of My Prison Life shortly after my release from prison on Jan 3, 2006. At that time, Bo was no longer in Liaoning, but his former secretary, Che Keming, was still a part of the leadership at Dalian Security Bureau in Liaoning province. I was under tight security monitoring for 3 years. Meanwhile, I kept following the story of Bo and his family and collected research for my first published book The Life of Bo Xilai. After landing in Toronto on Feb 4, 2009, I felt huge relief at being able to write and report freely without looking over my shoulder. The Life of Bo Xilai has since been published in Hong Kong and more than a million words have been republished in Chinese media outside mainland China. Those articles focused on the life of Bo and his family in the past decade. I have reason to believe that these articles played a key role in expediting Bo’s downfall. I truly believe the details of his case will be publicly revealed by the Chinese central government in the days to come. If that happens, I will feel delighted and have no more regret for myself since my personal sacrifice will have helped to bring about justice. CF: What does the Bo Xilai scandal tell us about contemporary China? JW: It makes two important points: firstly, it is unprecedented under the leadership of president Hu Jintao for a Communist party official as senior as Bo to be toppled. This will have a profound impact on Chinese politics. Secondly, Bo’s case signals an urgent need for political reform. Corrupt officials like him are the outcome of a centralized, one-party political system with insufficient oversight. 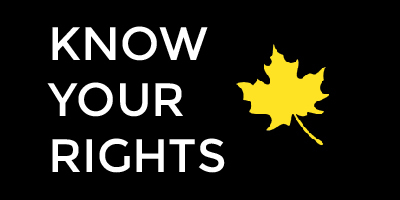 The government cannot discipline public servants properly without an independent judicial system and freedom of press. It is sad that we have had to wait so long for this corruption to be brought to justice; so much damage has been done. Democracy and a transparent legal system would have helped to prevent these crimes much earlier. CF: Are human rights in China more respected now than they were ten years ago? JW: There have been certain changes compared with ten years ago: living conditions in China’s prisons, for example, have improved a lot. But overall, in essence, not much has improved. Respect for and the protection of human rights still has a long way to go. CF: Your harassment by Chinese officials continued even after you settled in Toronto in 2009. And yet, successive Canadian officials, including prime ministers, made a point of courting Bo Xilai. Should western governments take a stronger stand on free speech when dealing with China? JW: Western leaders rarely have the chance to get to know Chinese officials well. They deal only with the surface. Bo successfully passed himself off as one of the new, open-minded Chinese officials instead of the old guard bureaucrats. He speaks English well, dresses in suits and has what is considered to be a genteel manner. As a former Minister of Commerce, he used to play a role in trade deals between Canada and China. Like many others who covet a piece of China’s market, the Harper government needed a trading partnership to improve Canada’s economy. Of course, anyone that could push this agenda would be a good friend of Canada. Bo was on that list of friends. But that shouldn’t mean that fundamental values like freedom of speech and human rights can be ignored. I’d like to mention one last thing: my home computer was the target of daily cyber attacks for more than 3 years before Bo’s downfall. Recently, it has been functioning surprisingly well. It’s not hard to guess who was behind those attacks. I feel true joy now, and sincerely pray that further improvements in human rights and press freedom will happen sooner in China. I sincerely hope that no other journalists will have to suffer a wrongful conviction like mine just because of what they have reported.